You can get more keywords ideas from the keywords suggested by search engines at the bottom of the search results page based on your original search term. You can extract these keywords quickly into your Excel worksheet. You don't even need to copy and paste from the search results page and to the worksheet. You can download this free Excel Add-In tool here. 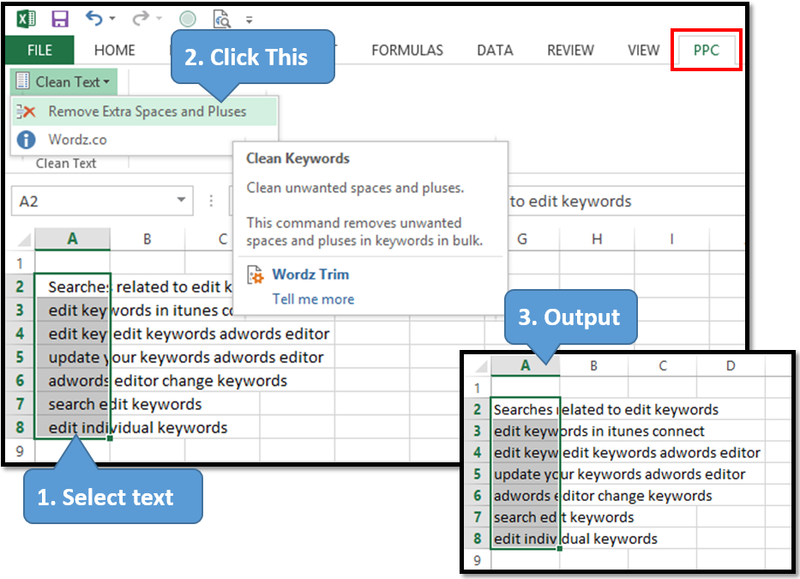 Note: For a comprehensive Excel Add-In to manage and manipulate keywords in bulk, check out our Keywords Editor, a "Swiss Army Knife" tool for keywords. Note 2: Search engines may change the layout of search results page from time to time, therefore this tool will need constant update. Visit this page frequently to get the most updated version. Wordz Trim is a simple tool to remove all spaces from text except for single spaces between words. You select the cells that contain the text and click to remove the extra spaces. You can download this free Excel's add-in tool here. Note: For more features to manage and manipulate keywords in bulk, check out our Keywords Editor, a "Swiss Knife" tool for keywords. Copyright 2014 - 2018 Wordz Studio. Simple theme. Powered by Blogger.